how to output a basic report. The presenter will be using the Windows version of the software. Participants are encouraged to bring their laptops. The room will be open at 1 p.m. All are welcome, no RSVP is required. There will be an additional training on NVivo 10 / 11 this fall semester. “Tapping Social Media Data using NCapture and NVivo” is scheduled 1:30-3:30 p.m. Friday, Nov. 20, in 401B Hale Library. K-State has a site license for NVivo 10 software (for both Windows and Mac systems) and NVivo 11 Pro (Windows) for all faculty, administrators, staff, and graduate students. The license allows two downloads and installs per eligible individual. The software and the activating license key may be accessed at K-State NVivo 10 Software Download with a current eID and password. A new license key for NVivo 11 Pro is available for the K-State research community. 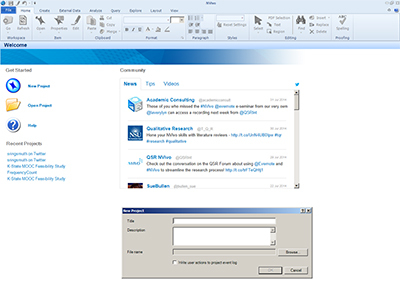 Log on to the site to access NVivo 11 Pro, which was released in late September. Those off-campus and / or undergraduate partners who are working with active and eligible K-State faculty, administrators, staff, and graduate students are allowed to use the K-State license during the duration of the non-commercial K-State-related research project. Those who have already started using NVivo can refer to “Using NVivo: An Unofficial and Unauthorized Primer,” which is an e-book built on the Scalar platform that highlights various features of the tool. If there are any questions, contact shalin@k-state.edu or call 785-532-5262.